The focus of the Darien Community Association’s annual Art Lecture Series this year will be on sculpture. Four lectures are scheduled every Thursday in October in the DCA’s Garden Room. Attendees will gain insights to better understand, enjoy and discern the sculptural work of art. 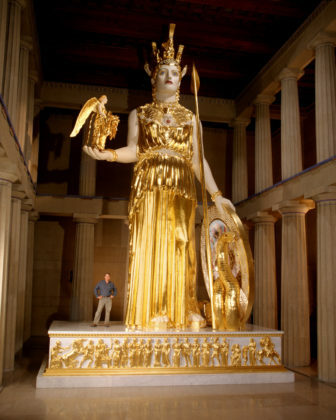 This full-scale replica of Athenian original in the Parthenon building, Nashville. Athena of Parthenon ca. 1990, gilded 2002. Sculptor: Alan LeQuire; gilder: Lou Reed. Familiar names they know, omnipresent as Pop stars: Andy Warhol, Picasso and Matisse; a Van Gogh masterpiece serving as background for a Selfie Facebook post; Leonardo da Vinci’s “Salvator Mundi” reaching a new auction record at Christie’s of $450 million galvanizes our attention. Unlike oil on canvas, a work of sculpture exists as a different reality than a painting. A quick glance is insufficient for full appreciation. Responding to a three-dimensional work of art involves a special kind of interaction between the viewer and the object. Essential to the appreciation of sculpture is light. Whether viewed in a gallery or out of doors in a sculpture park, the shadows interact with the mind and eye of the viewer to create an experience. Active and constantly changing, the movement of the viewer combines with the surface tensions to create different impressions both felt and observed of the dynamic angles created by the artist. The Series begins with Brinda Kumar on Oct. 4, a curator of the recent exhibition at the Met, Breuer, Like Life: Sculpture, Color and the Body (1300 – Now). Taking over two whole floors of the museum, the organizers of the exhibit were looking to re-prioritize sculpture. Organized in the galleries with juxtapositions of the contemporary and current with the ancient, and every century in between, the viewer is exposed to 700 years of engagement of the artist’s imagination with the inanimate body, yet fully life-like expressions of us. Familiar and always challenging the viewer — what artists do. They make us want to look, to help us see ourselves in new ways. Roberta Smith, art critic of the New York Times praised the curatorial vision of the show. On Oct. 11, Jane Becker of the Metropolitan Museum of Art will give new perspective with her lecture, Camille Claudel, Auguste Rodin, and Influence Undone. On the heels of a year that marked the 100th anniversary of the sculptor’s death, she will examine not only the expected solo genius of the great artist, but a fuller and less familiar story of their interactions together. Camille’s face was a muse and model which constantly haunted Rodin. He was Master, she was the student. What were the aesthetic consequences of their artistic relationship? A large number of his works bear testimony to the passion which he felt for her, even long after their break up. “She will have her own space” he said, in the museum in Paris which he planned and would bear his name. Now, a century later not only does she have a room of her own at his museum, but an entire building dedicated solely to her works of sculpture at the Camille Claudel Museum in France which just opened in 2017. On Oct. 18, Milette Gaifman, of Yale University will speak about Athena of Parthenon: Icon of Democracy. The Classical Ideal as represented in this 5th century Hellenistic sculpture embodied the patriotism in monument form of the Athenian state. Towering over 40 feet tall, constructed of ivory and an estimated 12 tons of solid gold, her wardrobe may have been the single greatest asset of the city. Pheidias, thought to be the sculptor, put at her base a sculptural relief of the birth of Pandora, who is best known for letting loose evils from her famous box. Of the many sculptural decorations on her figure were representations of the mythological battles of the struggles between the forces of justice and injustice, order versus chaos. In the early 20th century, revolutionary sculptural forms were created of the human figure. In the final lecture of the Series on Oct. 25, Joan Pachner, author of David Smith (1906 – 1965) will share with us how Smith altered the course of American sculpture by using industrial techniques and processes of the car assembly line through the use of welding to radically transform sculpture. He created new languages by ignoring old rules that had governed and inhibited sculptors for centuries. Characterized by a seemingly endless flow of formal inventions, his goal was never complete abstraction; he was continually inspired by the human figure, although he did dismantle and reimagine its form. He envisioned his work as a continuation of the flow of visual history reaching back to prehistoric times. He insisted that he “belonged with painters”, even though he earned his place in the history of art as a sculptor. The “Human Form in Space: Sculpture” series runs Oct. 4, 11, 18 and 25 lectures begin promptly at 11, with luncheons to follow at Darien Community Association 274 Middlesex Road Darien, CT 06820 203-655-9050 extension 10 or online. All lectures will be followed by a luncheon specially designed by Diane Browne Catering. The DCA’s 2018 Art Lecture Series Sponsor is Laurel Road Bank. Series admission, including four lectures with gourmet luncheons, is $195, or $175 for DCA members. Single lecture with luncheon admission is $55, or $50 for DCA members and prepayment is required for all lunch reservations by noon on the Friday preceding each lecture. Lecture only (without lunch) is $25, or $20 for DCA members. Walk-ins welcome for lecture only, however, it is recommended that reservations and payment be made 24 hours in advance to assure a seat. Register online through dariendca.org, or contact the DCA directly at info@dariendca.org or 203-655-9050 extension 10.